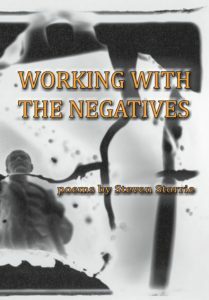 Working With the Negatives, Steven Storrie. Steven Storrie writes unadorned poems with subtle angles and a light touch, even as he rails against the sociopolitical currents dragging at his feet. Working With the Negatives offers us poems that capture experience in a way that privileges that experience as much as the poem, that steer our attention back and forth between loss and desire.